MINNEAPOLIS — This is the picture of a team trying to cope with the cruel side of college basketball fate. This is the Auburn locker room. A young man sits in his chair, with the tattoo lion hearted on his chest. The next few minutes, Samir Doughty must be exactly that, for the cameras have crowded around, wanting to know his feelings about the last second of a Final Four game that neither Auburn nor Virginia will soon forget. It was a foul. He did indeed invade Kyle Guy’s space on that last-ditch 3-pointer from the corner, which sent Guy to the line with 0.6 seconds and Auburn ahead 62-60. Swish, swish, swish. Three makes later, by a player who was an 81.8 percent free throw shooter, and Virginia’s magical mystery tour of redemption was going one more stop, to the very last Monday night. The Auburn Tigers had only a devastated locker room to go. They may never accept that foul. Their fans won’t. 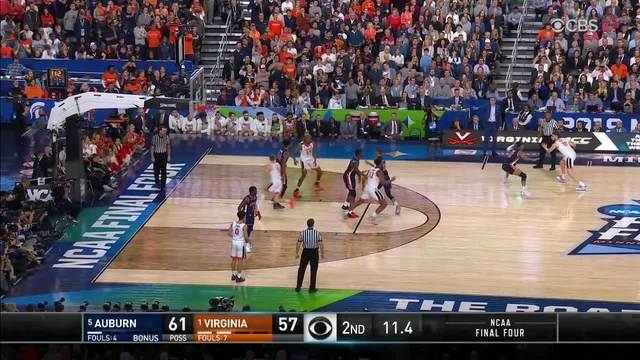 Whether it should have been called after a physical game, whether a Virginia double dribble was missed a few seconds earlier. But at this moment, there is nothing to do but stare ahead and try to put it into words. The Tigers had labored so hard to come from 10 points down in the last 5:22 against a renowned defense to get the lead, but suddenly there was nothing left to do but hope Guy missed, at least once. But deep down, Doughty knew. “That’s just how basketball works. A great shooter gets fouled on a 3-point play. I was pretty sure he was going to make them. Soon, they trudged back to the locker room, the game and season suddenly gone. What was that like in those first few minutes? “No words. Everybody was tearing up, like you’d expect,” he says, with his own eyes reddish. “We just wanted to play for each other and that ends right here. Across the way, Steven Pearl sits at a locker. He is an assistant and Bruce Pearl’s son. Where the ball went that last second, they all expected on the Auburn bench. In a corner, Bryce Brown sits in a chair. There is already a video making the online rounds of him shouting the NCAA needs new referees as the Tigers returned to their locker room. “I regret saying that. I just got caught up in the moment. I apologize for that,” he says. Everyone could agree that – bad call or good call – it was unfortunate that a Final Four game end amid such uproar. You have to go back 30 years to the 1989 championship game, where a highly debated foul with three seconds left gave Michigan the two free throws needed to beat Seton Hall by a point in overtime, to find something similar. Unfortunate, because it takes attention away from the remarkable journey Virginia is on, having pulled consecutive games out of the fire in extraordinary ways, this one to go with Purdue. “Survive and advance. I guess that’s taking on a new meaning,” coach Tony Bennett said. Unfortunate, that it distracts from Auburn’s gritty rally, and from the fact that Virginia is now one game away from a storybook ride to redemption from the UMBC loss. And unfortunate, that what won’t be talked about enough is hard it was for Kyle Guy – no matter how glowing his free throw percentage – to stand at the line and make all three free throws. “Those are moments that every basketball player has dreamed of, hitting the game winning shot or free throws or whatever,” he said later. “Kind of had that feeling in your stomach, like a good nervousness, like, all right, this is my chance. But Auburn’s pain, and how it came to pass, was at center stage. And his first words to his team afterward were not about questionable whistles or no-whistles. “We didn’t focus on that. We focused on how we were going to handle the defeat at Auburn with class and dignity. There are lots of calls during the game and you’re going to get some and some you’re not going to get. Back in the locker room, his players are trying to heed that advice. But still, Samir Doughty is curious about the ending.